PHOENIX (PRESS RELEASE) – The Valley is about to get a whole lot hotter with LUSTRE Rooftop Bar launching its highly anticipated “100 Days of Summer” weekly event series complete with daily pool parties, live music and food and drink specials. Perched on the third-floor pool deck of Kimpton Hotel Palomar Phoenix, LUSTRE is an oasis in the heart of downtown Phoenix with cabanas that offer sweeping views of the city skyline, craft cocktails, and seasonal menu items perfect for enjoying poolside. Named one of the best hotel rooftop bars by USA Today and Travel + Leisure, LUSTRE is also ushering in a new menu that features light and refreshing seasonal cocktails and bites. Some standouts include the Papa Pina ($12) with Hornitos Cristaliano Tequila, carmalized pineapple, lime and agave ; Van Zandt Mule ($12) with Tito’s Handmade Vodka, prickly pear puree, lime, simple syrup and Goslings ginger beer; Blood-Red Sol ($12) with Hornitos Cristaliano Tequila, solerno, blood orange, lime and agave; Ancho Skirt Steak Nachos ($15) with cheddar, pepper jack, queso, jalapenos, boracho bean, corn, tomoatoes, cilantro, sour cream, salsa and guacamole; and Honey Siracha Mini Bone-in Pork Shanks ($14). Available from 11am until 6pm with proof-of-employment. A live DJ will entertain guests from 2pm until 6pm. Specials include half-off Pina Coladas, couch and cabana rentals and bottle service with Don Q Rum. Available from 11am until 6pm. A steel-drum band or live DJ will be playing each week. Food and cocktail specials include $12 batched Zombies, $10 batched Mai Tais, $9 King Kongs and half-off pork and pineapple flatbreads or sliders. Specials include half-off Aperol Spitzers and cabana spritz kits. Available from 3pm until close. Beer samplings, tastings and giveaways will be held from 5pm until 8pm. Weekly partners include O.H.S.O Brewery and Distillery, San Tan Brewing Co., Barrio Brewing Co., Four Peaks Brewing Co., Huss Brewing Co., and Clown Shoes. Specials include half-off local draft beer of the week. Pool opens at 11am. The party goes from 12pm until 6pm. Specials include half-off Malibu well drinks and $8 Pina Coladas. Guests will enjoy giant pool inflatables and complimentary gifts. Pool opens at 11am. The party goes from 11am until 1pm. Specials include hosted cabanas by Effen Vodka with two bottles of Effen Vodka, half-off Cool as a Cucumber cocktails and $5 Effen Vodka Bloody Mary’s. Specials include half-off Van Zandt Mules. Guests will enjoy complimentary gifts and giveaways. For those looking to extend their summer fun, Kimpton Hotel Palomar Phoenix is offering the “Fast Forward to Summer” package that runs from Memorial Day through Labor Day. The package includes the best flexible rate and a $25 daily dining credit at Blue Hound Kitchen & Cocktails and LUSTRE Rooftop Bar. 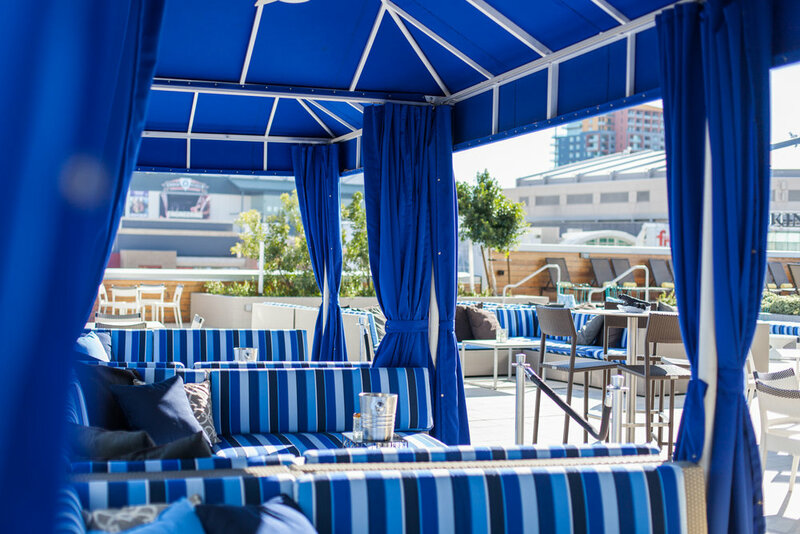 To book a cabana at LUSTRE Rooftop Bar, call 480-478-1716 or email kendall.hain@bluehoundkitchen.com. To book a stay, visit www.hotelpalomar-phoenix.com or 602-253-6633. Kimpton’s Hotel Palomar Phoenix opened June 5, 2012 in the heart of vibrant downtown Phoenix at CityScape, a dynamic new mixed-use development featuring shopping, entertainment and dining. Hotel Palomar Phoenix is an urban retreat that strikes the balance between the energy of its city setting and Arizona's laid-back lifestyle. The boutique hotel offers 242 spacious guest rooms and suites, all with modern interior touches and views of the surrounding city and mountains. In step with the signature style of Kimpton's Hotel Palomar, this Phoenix destination combines contemporary design with an "Art in Motion" theme embracing the undercurrent of artistic energy throughout. Amenities include approximately 10,000 square feet of multi-use space across 10 meeting rooms, which can be customized for social and business events. The adjacent Blue Hound Kitchen & Cocktails showcases a menu of new American cuisine for lunch, dinner, late-night and weekend brunch and a blazing cocktail program that raises the bar for drink culture in the city's urban core, while the hotel's third-floor outdoor pool terrace and adjacent LUSTRE Rooftop Bar provide a scenic venue for gathering. Hotel Palomar Phoenix at CityScape is located at 2 E. Jefferson Street, Phoenix, Ariz. 85004. To learn more, visit www.hotelpalomar-phoenix.com. Located in the heart of Downtown Phoenix, CityScape Phoenix is a place where people come together for dining, nightlife, shopping, entertainment, business, living, community events and celebrations of all kinds. The perfect spot for a spontaneous night out on the town, CityScape Phoenix is a $500 million mixed-use, high-rise destination that is home to more than 20 retailers including Urban Outfitters, Lucky Strike, The Corner, Stand Up Live, Charming Charlie, The Arrogant Butcher and Kimpton’s Hotel Palomar Phoenix. CityScape Residences, 224 luxury apartments, sit atop the hotel and residents have full-access to the property’s world-class services. Surrounded by light rail stops and adjacent to the Valley’s premier professional sports and entertainment venues, CityScape Phoenix is steps away from Talking Stick Resort Arena, Chase Field, the Phoenix Convention Center, Arizona State University's downtown campus and state and government offices. In an area that once lacked a central core, CityScape Phoenix has become an authentic urban space that connects people and generates energy, creativity, enterprise and excitement all day, every day in one central location. It all starts here. For more information, a tenant directory or to see what’s happening, visit www.cityscapephoenix.com. San Francisco-based Kimpton Hotels & Restaurants is a leading collection of boutique hotels and restaurants and the acknowledged industry pioneer that first introduced the boutique hotel concept to the United States. In 1981, Bill Kimpton founded the company that today is renowned for making travelers feel genuinely cared for through thoughtful perks and amenities, bold, playful design and a sincerely personal style of guest service. Out to help people live full, balanced lives, Kimpton aims to inspire with touches like yoga mats in every room, complimentary coffee and tea to start the day, hosted evening Wine Hour, in-room fitness programming and complimentary bike rentals. The award-winning restaurants and bars are led by talented chefs and bartenders that offer guests a chance to dine like a local. Kimpton is consistently ranked as one of the top companies in the Market Metrix Hospitality Index, Upper Upscale Segment, for Customer Satisfaction. The company is highly-regarded for its innovative employee culture and benefits and has been named a FORTUNE magazine “Best Place to Work” four times since 2009. Kimpton is continuously growing and currently operates over 60 hotels and 70 plus restaurants, bars and lounges in 30 U.S. cities. For more information, visit www.KimptonHotels.com.